Despite being without a pick in either of the first two rounds, the Houston Texans came away from the 2018 NFL Draft with potential starters at positions of need and key depth additions on Days 2 and 3. 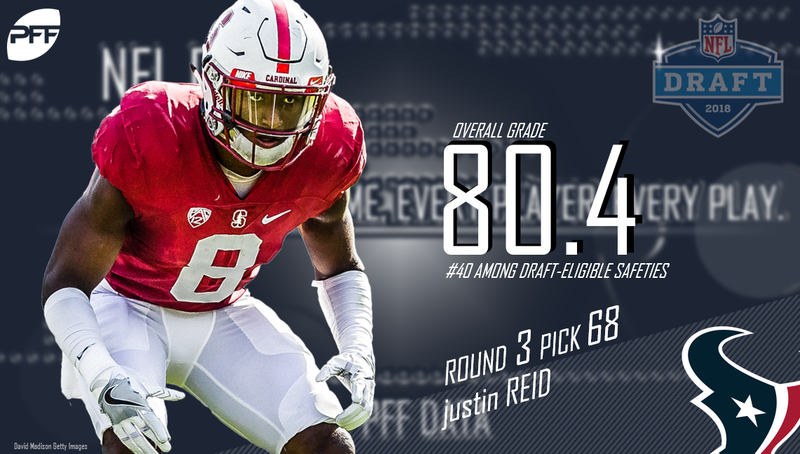 Former Stanford safety Justin Reid, Houston’s first of three third-round picks, is coming off a solid year (80.4 overall grade) in 2017 and his potential as either an in-the-box or deep safety is well worth the investment. He attacks the line of scrimmage with great physicality when defending the run or shallow passes, and he had significant success playing the ball in the air while in coverage. He finished his collegiate career with 65 defensive stops, 14 passes defensed and four interceptions. With pressing needs up and down their offensive line, the Texans were smart to add a versatile piece to the puzzle in former Mississippi State offensive tackle Martinas Rankin. A former JUCO transfer, Rankin improved in Year 2 of his FBS career while playing left tackle for the Bulldogs, but he best projects as either a guard or center at the next level given his lackluster athleticism. His pass protection will improve if given the opportunity to work in a phone booth at interior offensive line, and his run-blocking should unquestionably follow suit. Texans’ Senio Kelemete has earned sub-54.0 overall grades every year of his NFL career, including a 48.3 overall grade across 748 offensive snaps at guard in 2017. Odds are Rankin is given the opportunity to start ahead of Kelemete this upcoming season. Houston also added value in both the fourth and sixth round, selecting former Texas Tech wide receiver Keke Coutee and Wake Forest edge Duke Ejiofor. Coutee is a proven game-changer with the ball in his hands, as he led all draft-eligible FBS wide receivers in yards after the catch (775). He also ranked second in the draft class in receiving yards from the slot (1,088) and passer rating when targeted (139.7). As evidenced by his three years of 82.0-plus overall grades, Ejiofor is a high-floor edge prospect that plays with great effort and active hands when attacking the passer. The 6-foot-3, 264-pounder also looks the part given his size and can carve out a role early as a special-teamer and rotational pass-rusher.